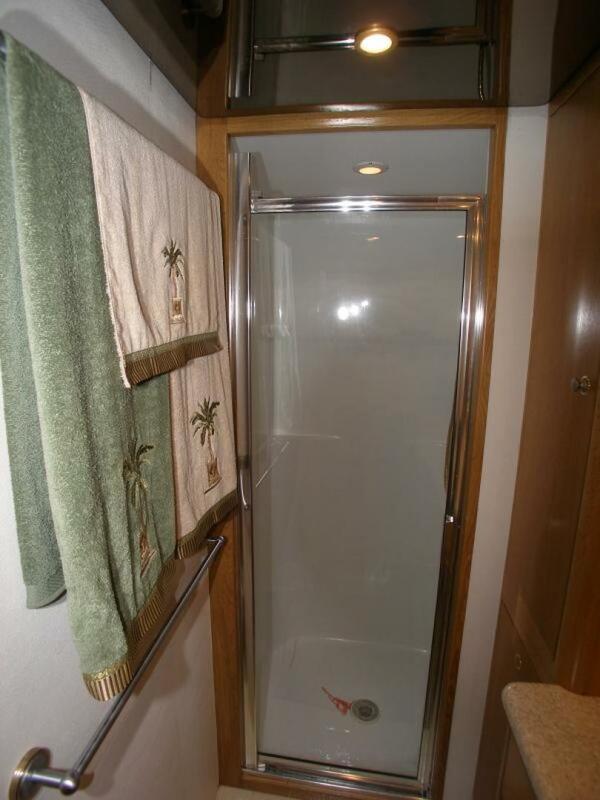 Now here is an opportunity! 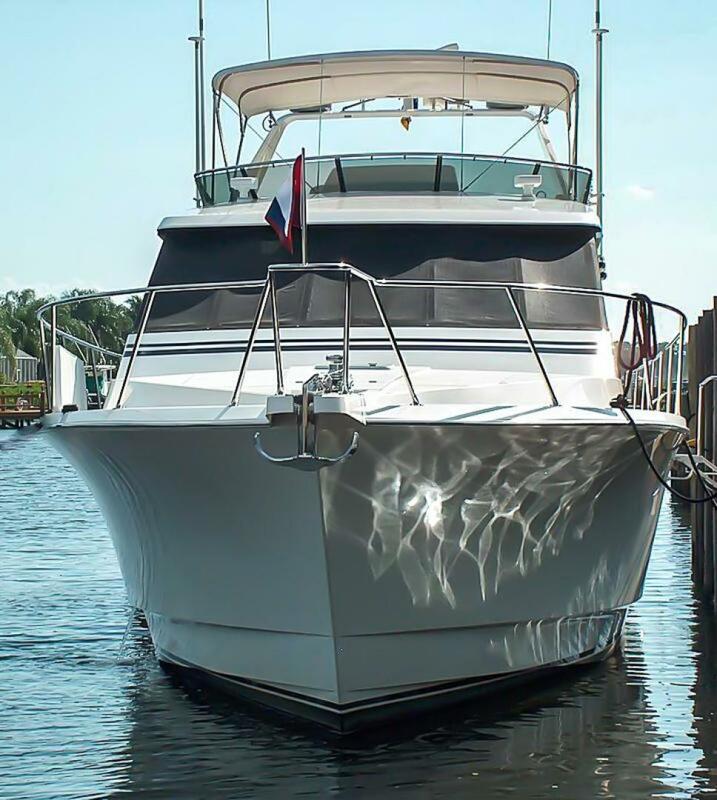 “Siboney” was originally built and commissioned as “Joan Marie III” and when West-Bay SonShip #58-31 was delivered new, she was at that time, the most extensively equipped 58 SonShip ever built. 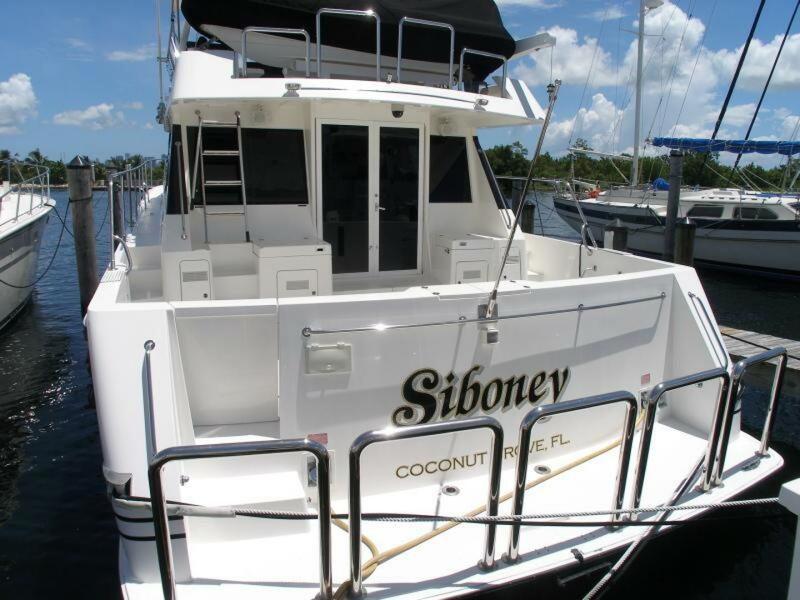 Due to the high quality of the West-Bay SonShip Yachts, low maintenance requirements and ease of access to service the systems, "Siboney" is still a yacht in great demand. 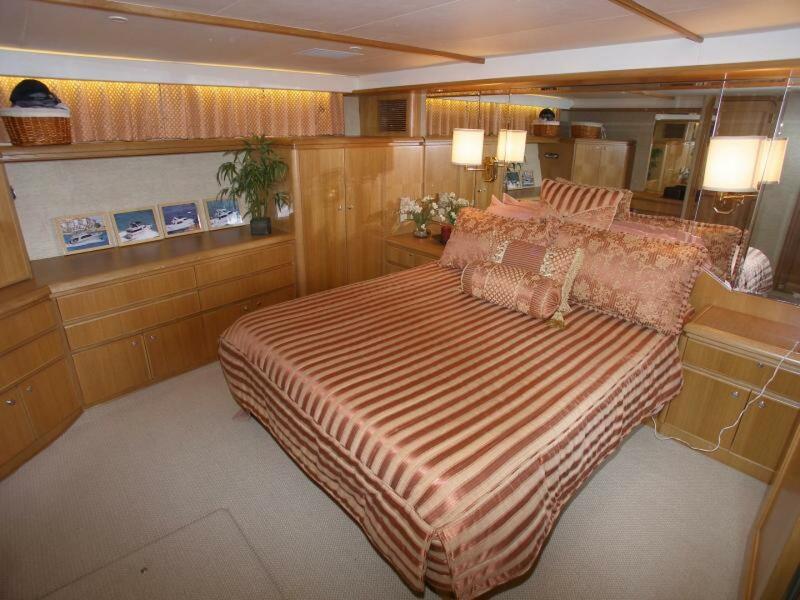 The Howard Apollonio N.A. 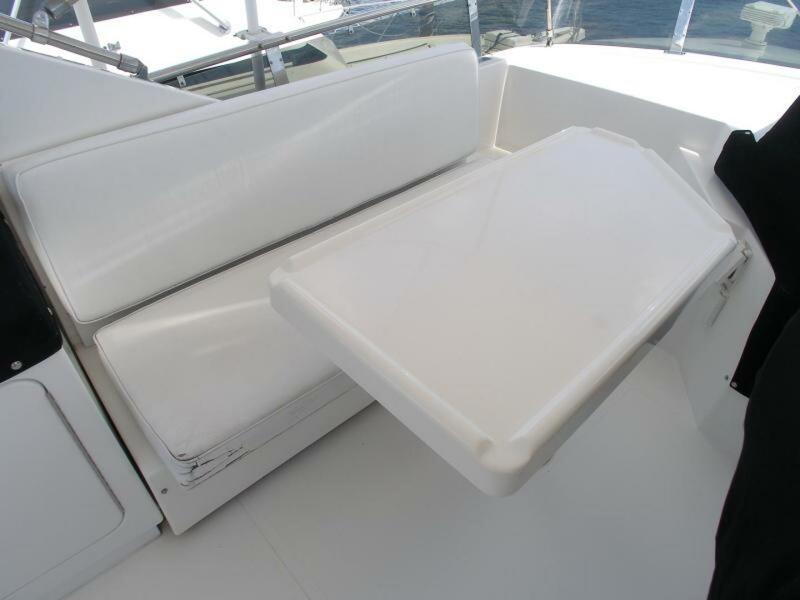 hull design is respected for providing a smooth, dry, and comfortable ride and is for these reasons, worthy of restoration. 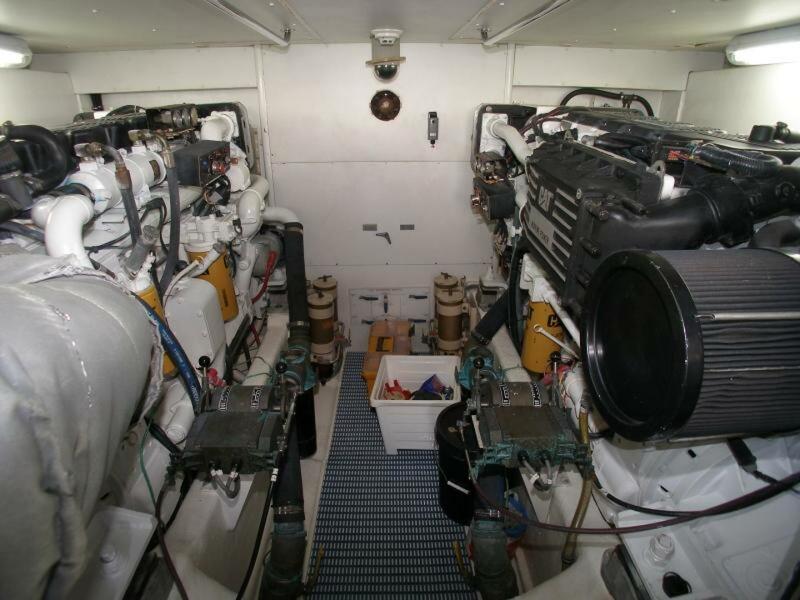 WBSS #58-31 is going to be a "bit of a project" after purchase as the ship's systems require servicing and the electronics need updating. 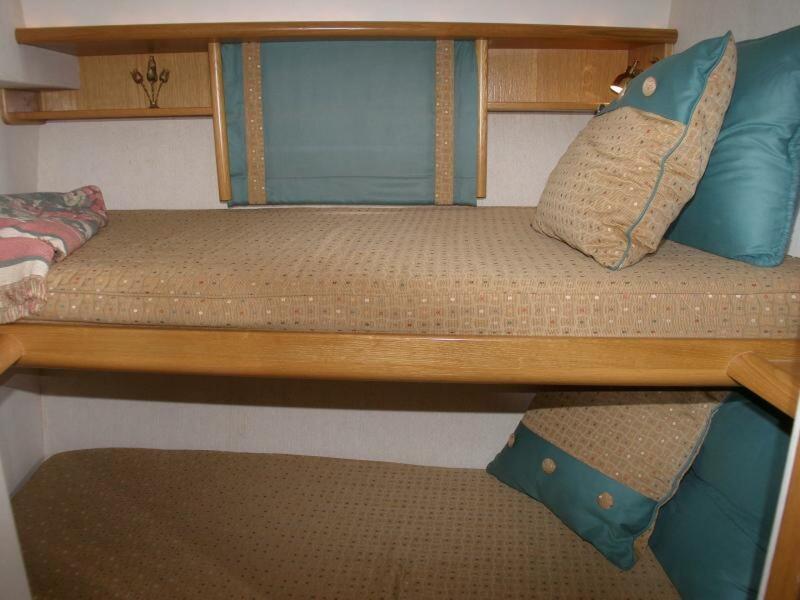 Also, the carpeting, headliners, wall-coverings and interior woodwork needs updating/refinishing before she will again show as well as she could and be ready for many more years’ service. 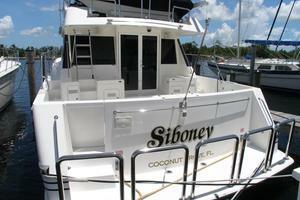 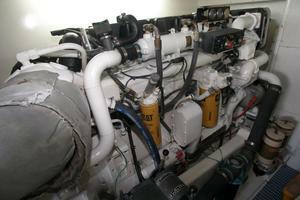 Siboney’s historically dependable Caterpillar 3406E, 800 HP engines, Naiad stabilization, 2nd. 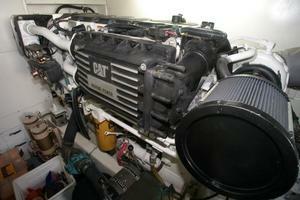 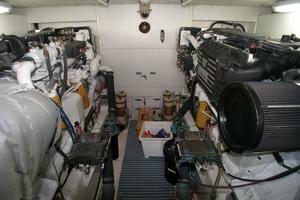 generator and bow thruster make this yacht worth buying and restoring to her past glory. 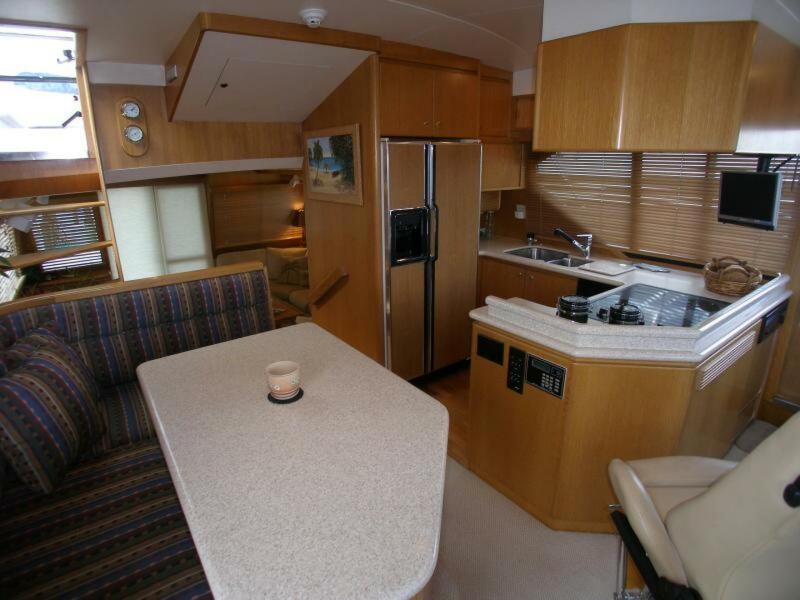 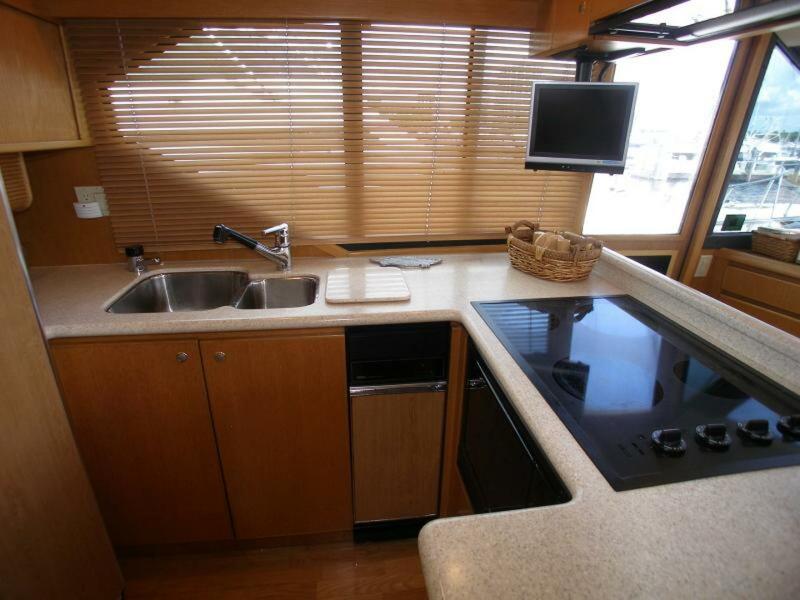 Some of Siboney’s other outstanding features include; dual Glendinning cable-masters, water-maker and a walk-in engine-room with 6’ standing headroom. 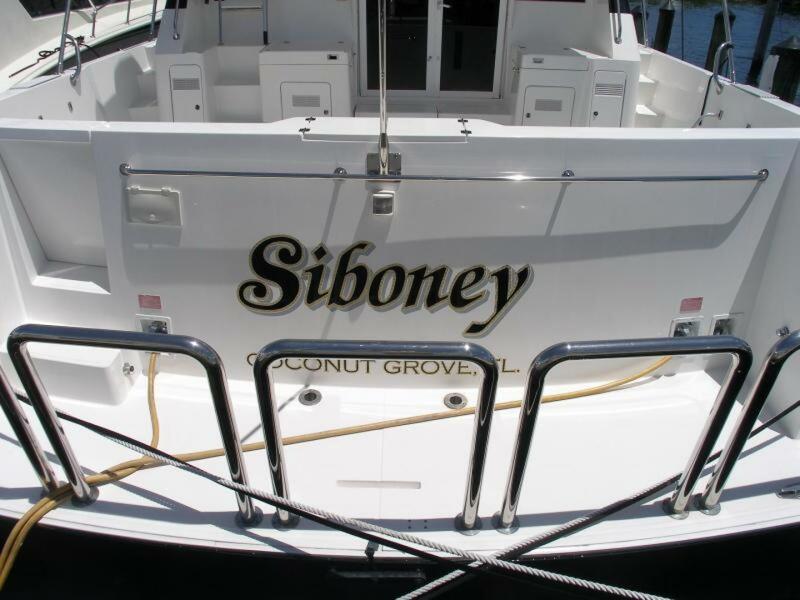 During March, 2018, "Siboney" was driven from her berth in Coconut Grove on Biscayne Bay up the Miami River where the yacht was hauled for a bottom job. 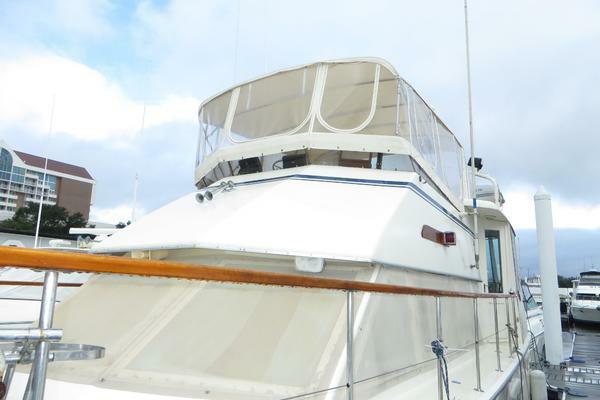 The yacht’s third owner for the last 11 years has priced the vessel to sell. 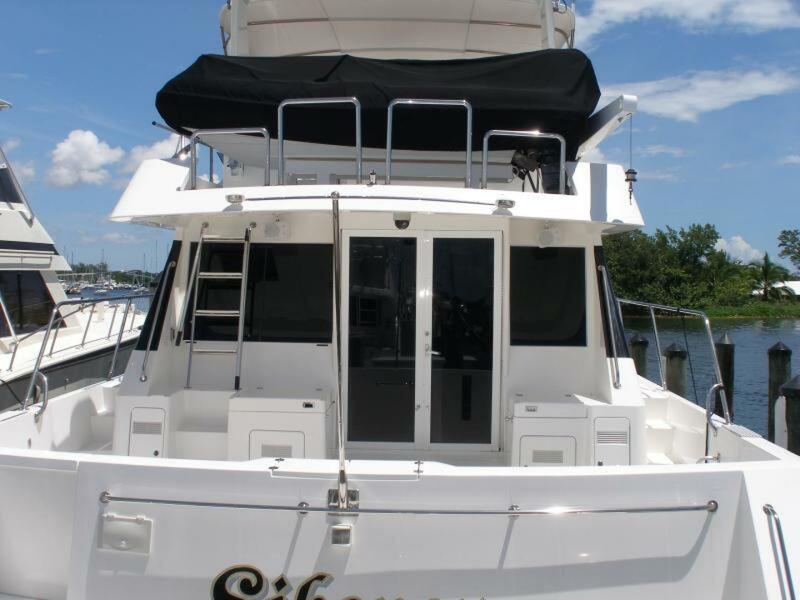 “Siboney” offers an exceptional opportunity for you to own one of the best designed yachts ever to have been built in this class size and is readily available to be seen by appointment in Coconut Grove, (Miami) Florida. 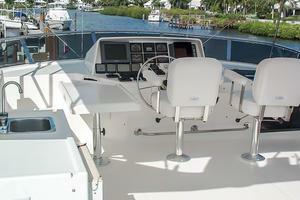 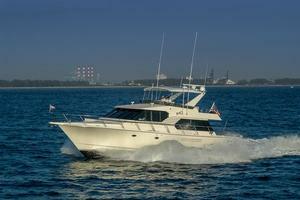 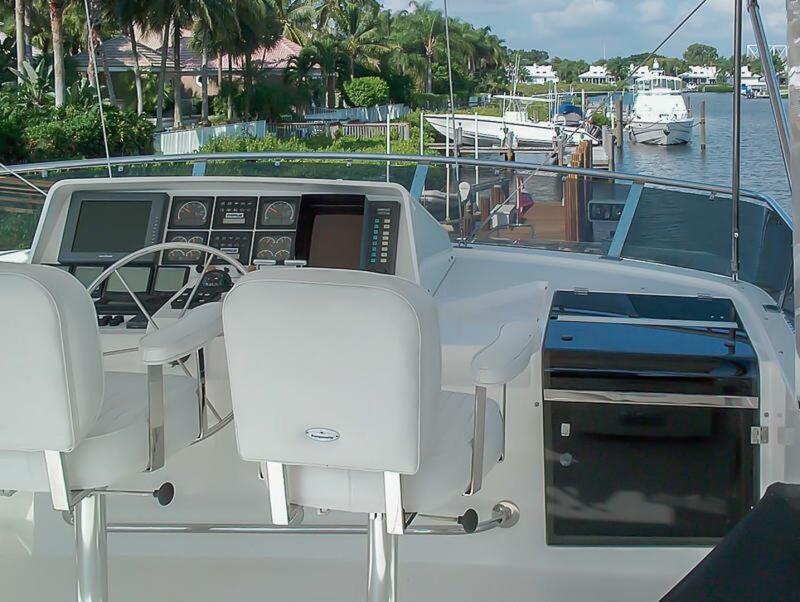 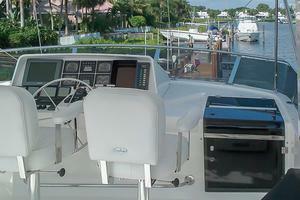 Starting aft, the West-Bay 58 features a large fiberglass aft-deck/cockpit. From here, a transom door leads aft and out onto a low maintenance molded in fiberglass swim platform or, one may proceed forward on wide side-decks to the bow. 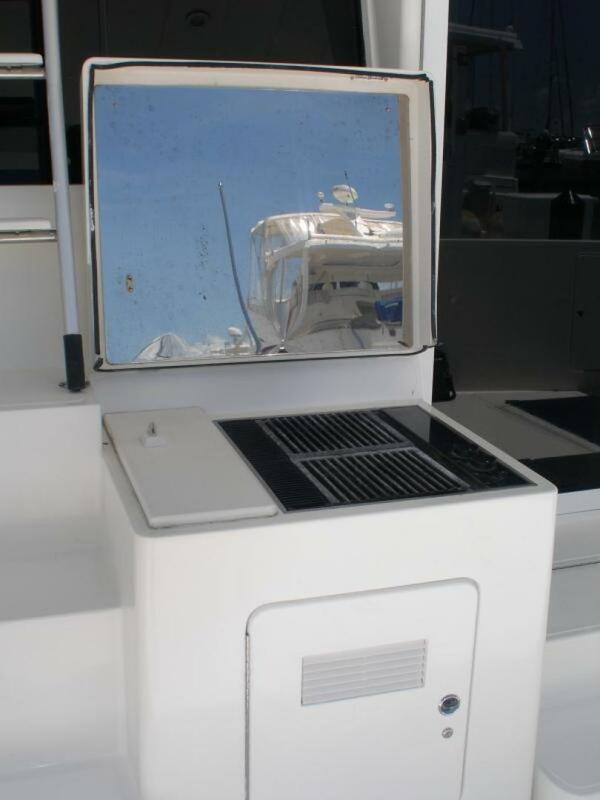 A huge lazarette beneath the aft-deck’s sole provides easy access to the ship’s battery banks as well as to this exceptionally large area for storage and just forward of the lazarette access hatch is the hatch leading forward and down into the walk-in engine room. 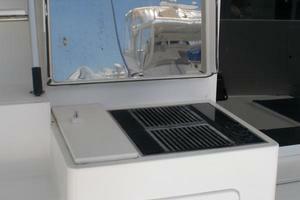 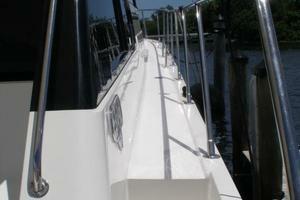 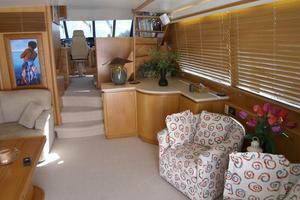 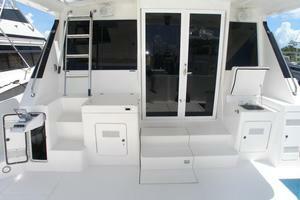 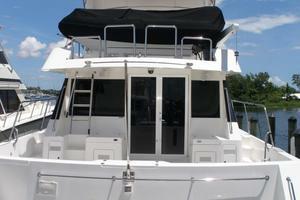 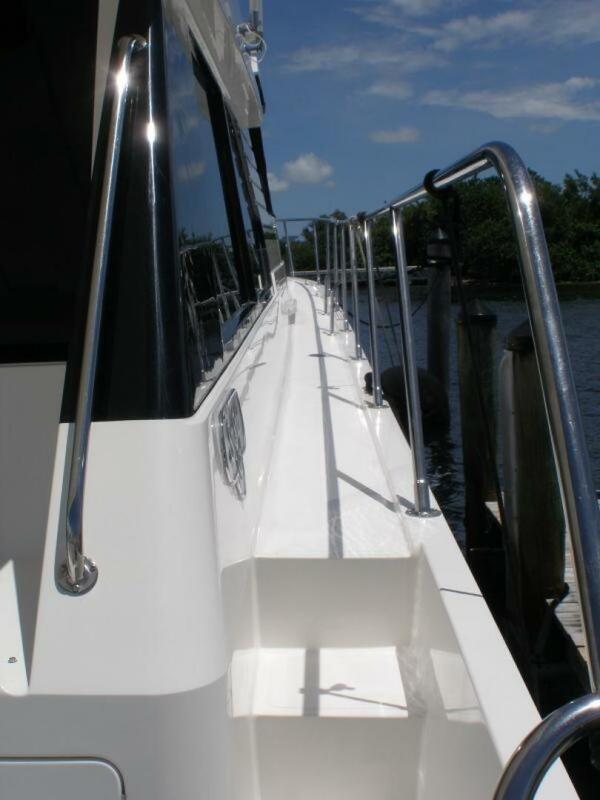 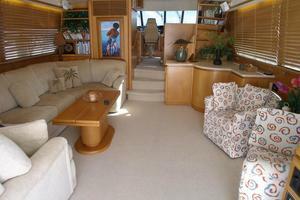 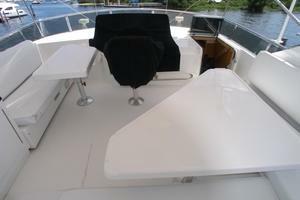 A set of stairs lead up to the boat-deck over-head or one may enter the salon through dual hinged tempered glass doors. 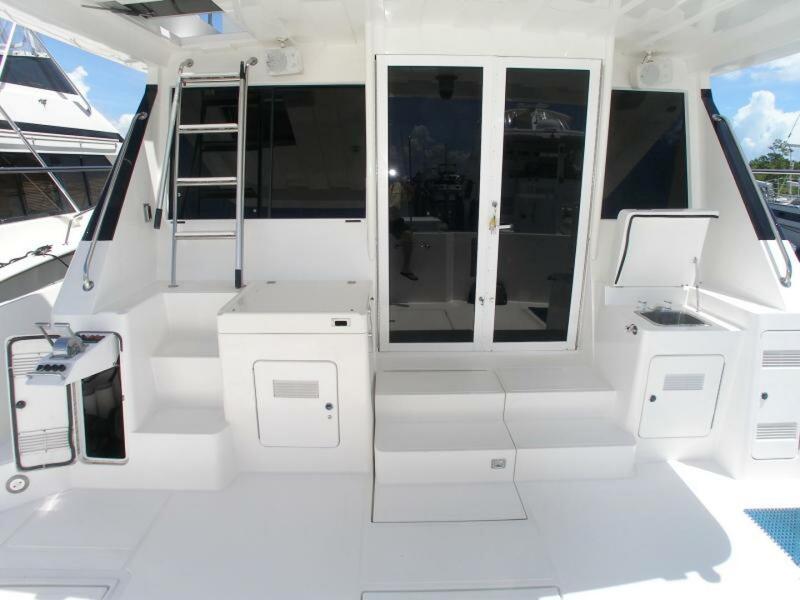 When opened, the dual doors into the salon from the aft-deck provide abundant bright natural lighting into an already bright and naturally well-lit area. 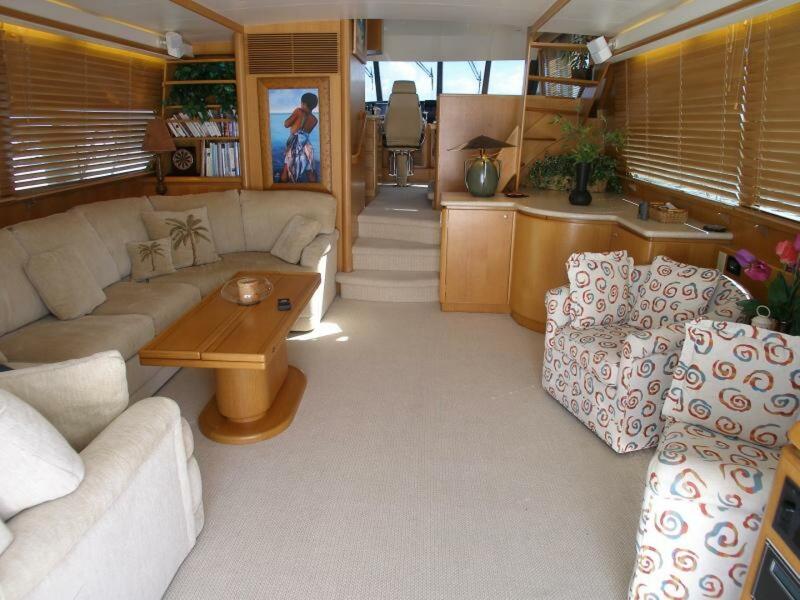 The result of “bringing the outdoors in” has the effect of making the already spacious salon appear even larger and more functional for entertaining guests and enjoying the scenery of an anchorage. 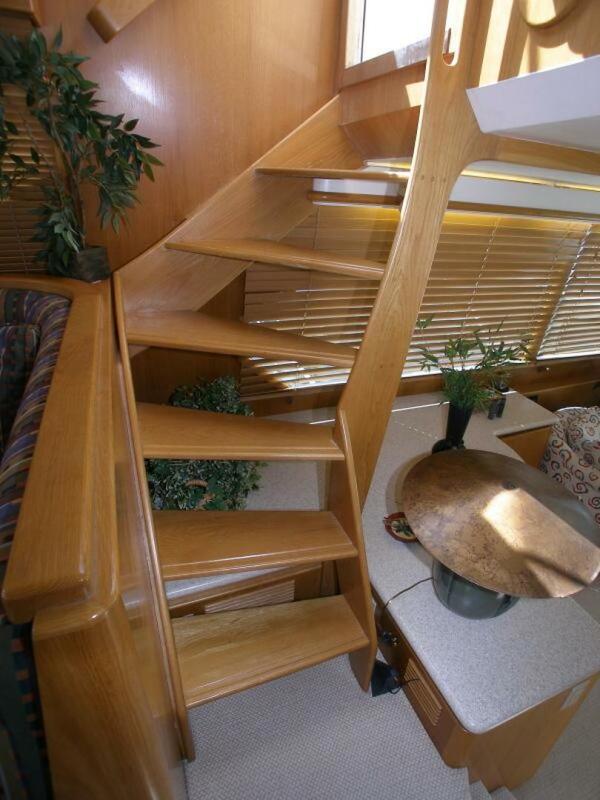 The whole of the interior is built of rift-sawn white oak hardwood that has been expertly hand-crafted and finished with stain to a honey tone. 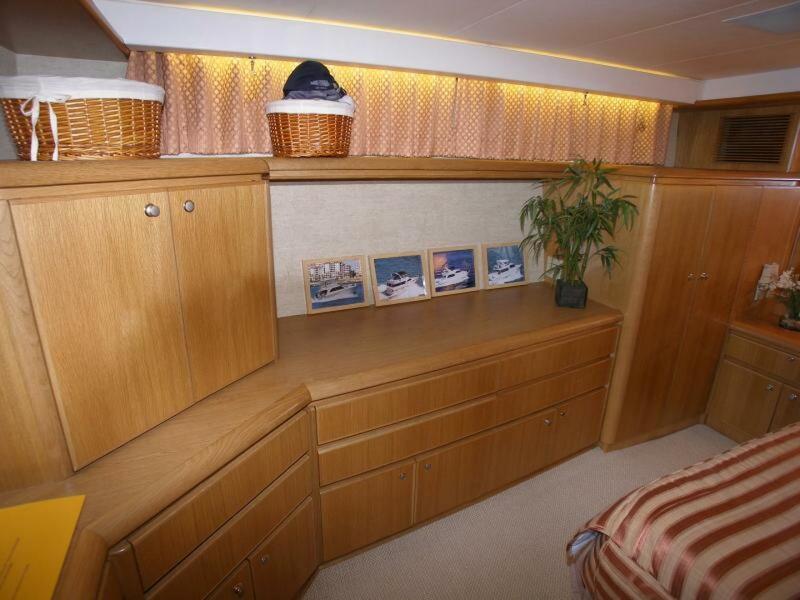 This hard wood resists scratching and gouging and after 17 years of use shows why it is a good choice of a quality shipbuilder. 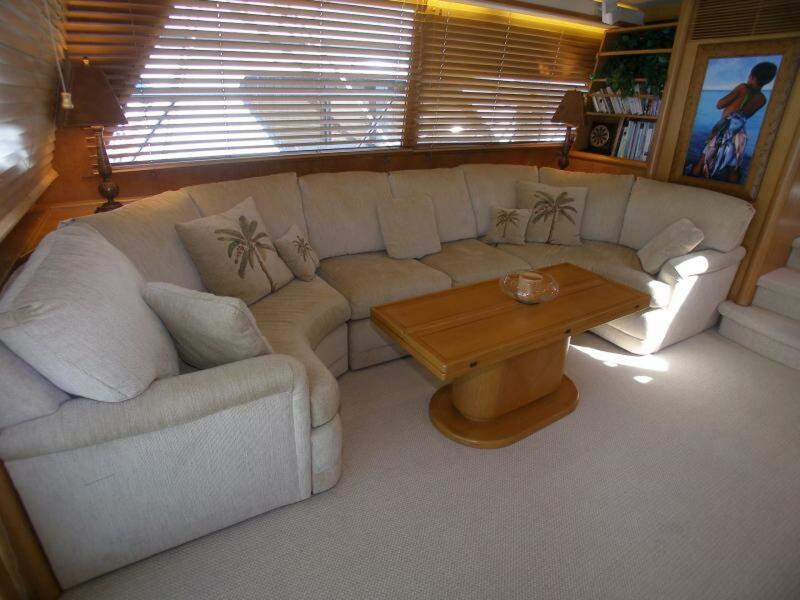 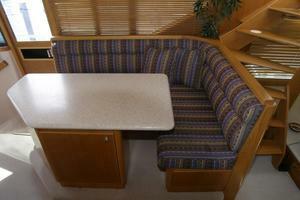 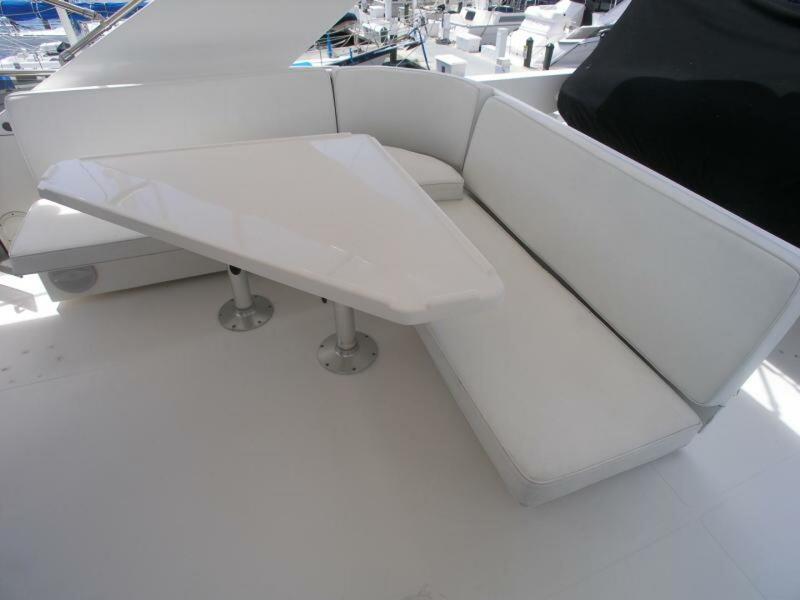 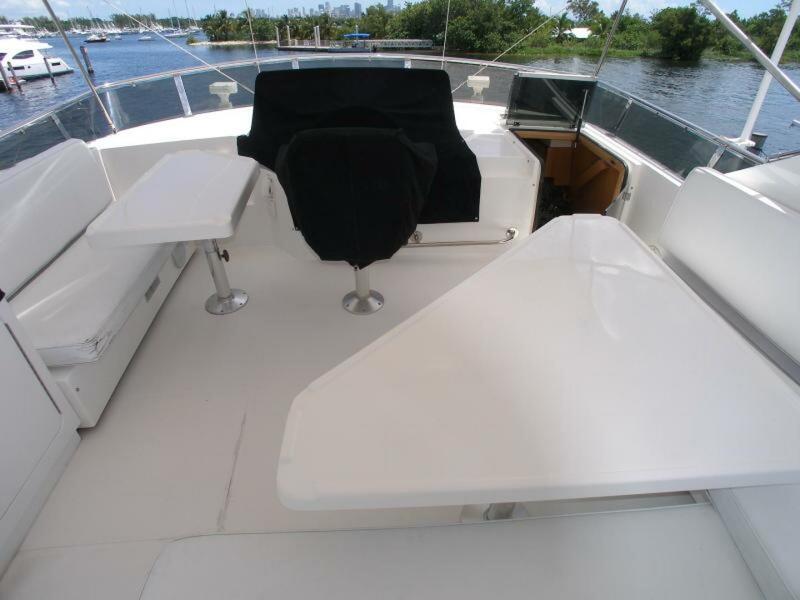 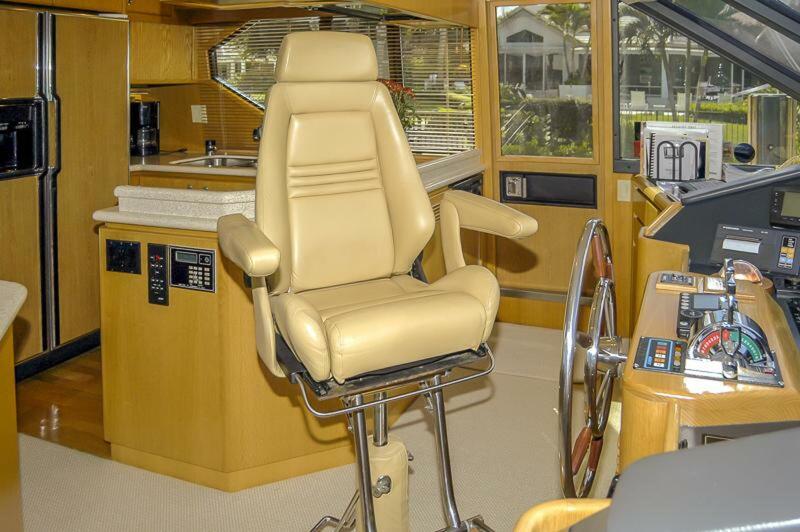 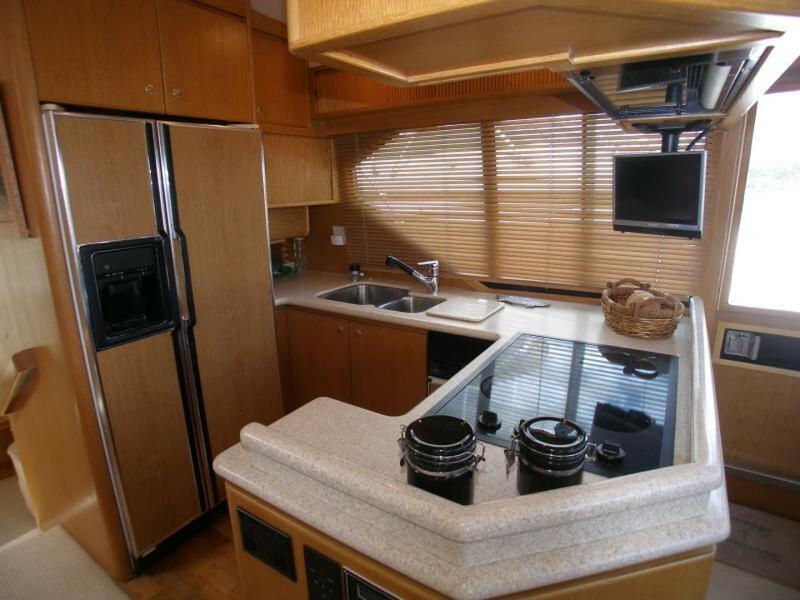 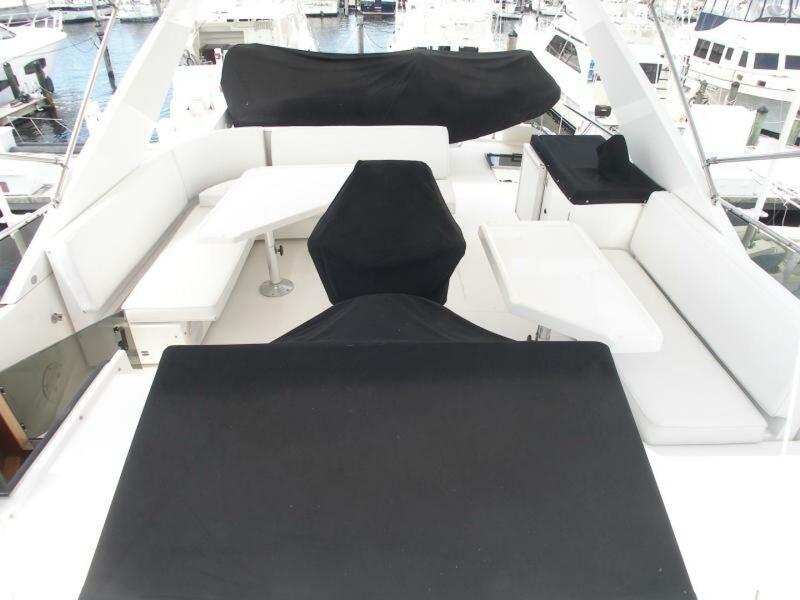 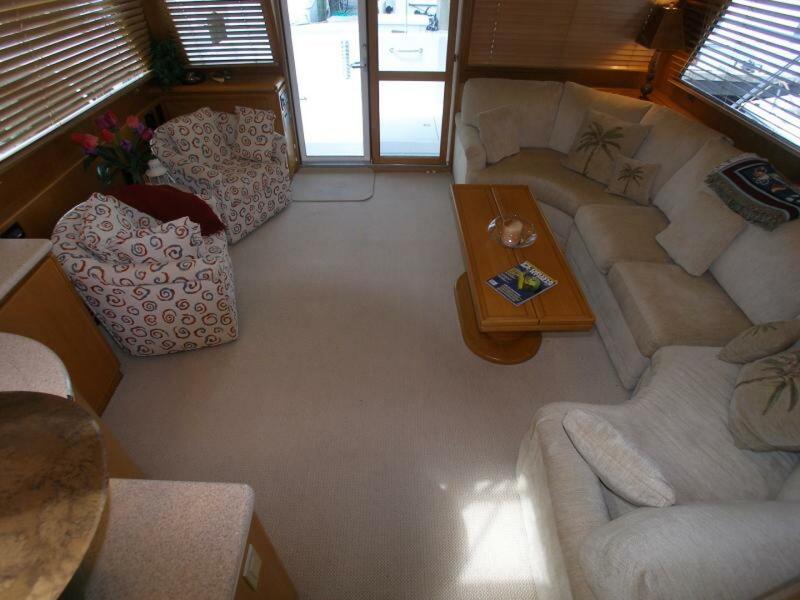 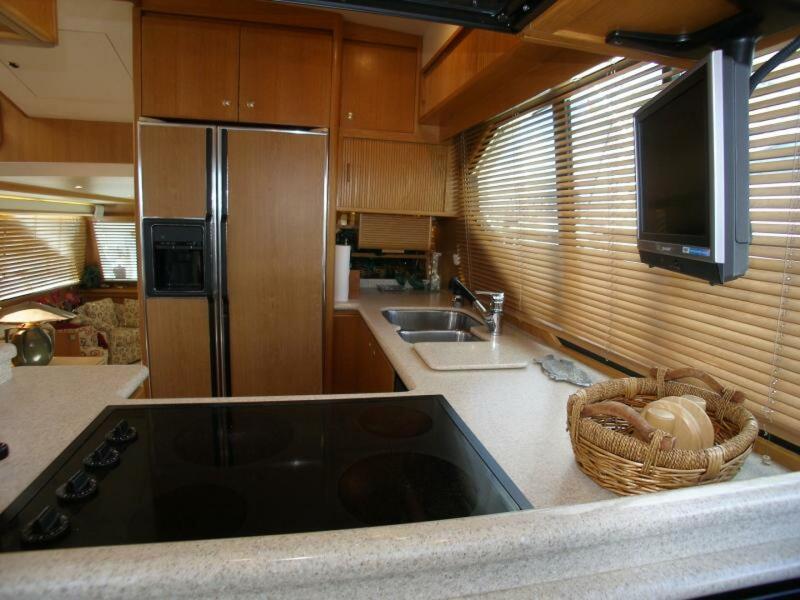 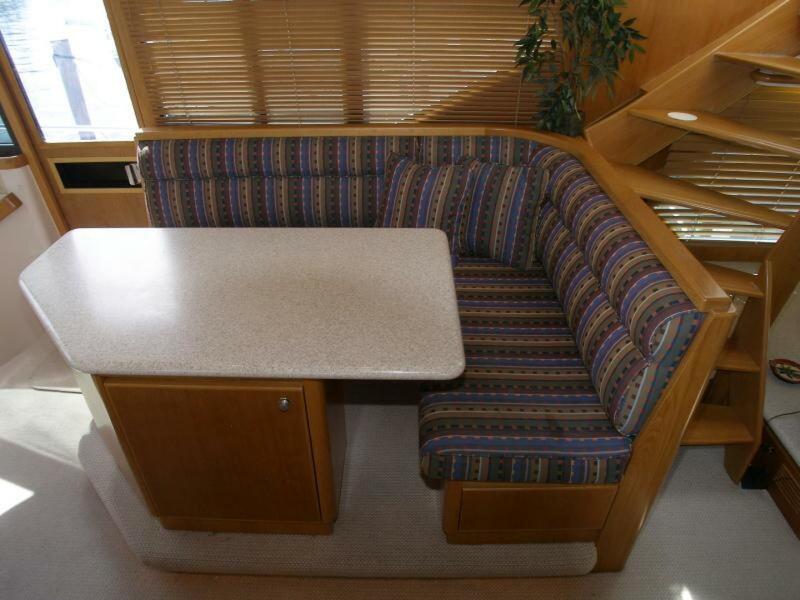 The salon features a custom built and most comfortable “U”-shaped sofa on the port side with an oak wood high/low coffee/dining table out front. 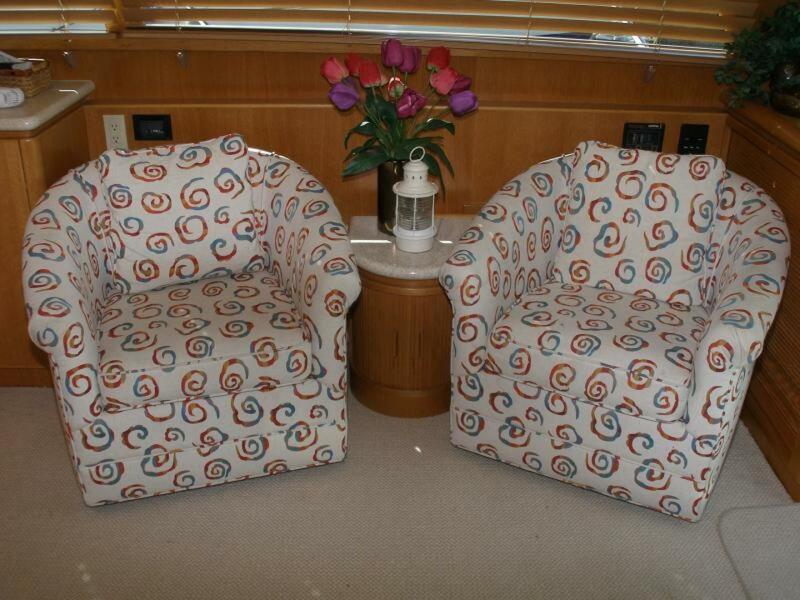 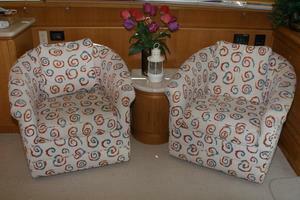 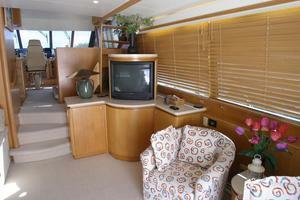 A pair of swiveling chairs is across the salon to starboard and just forward of these is the entertainment center. 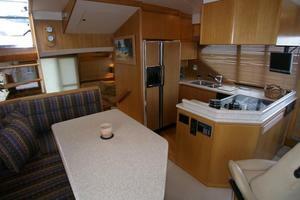 Headroom is 6’ 8” throughout most of the interior areas. 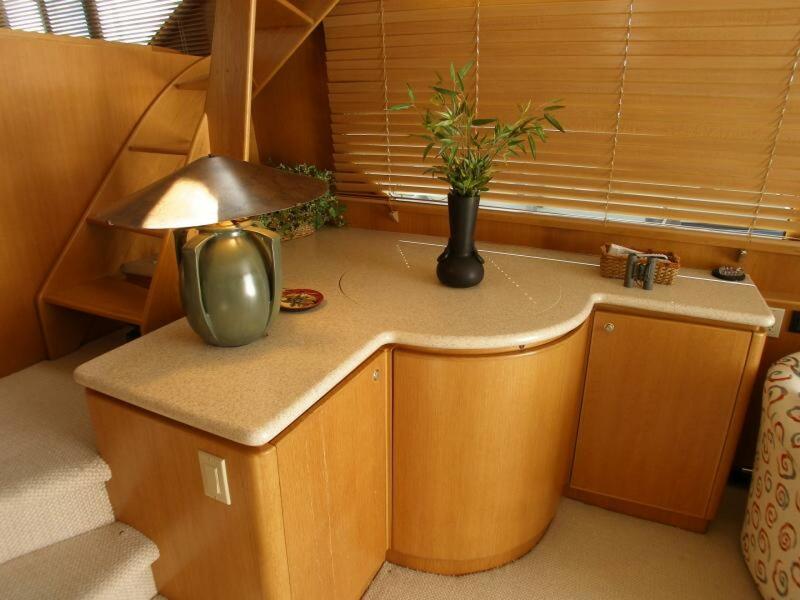 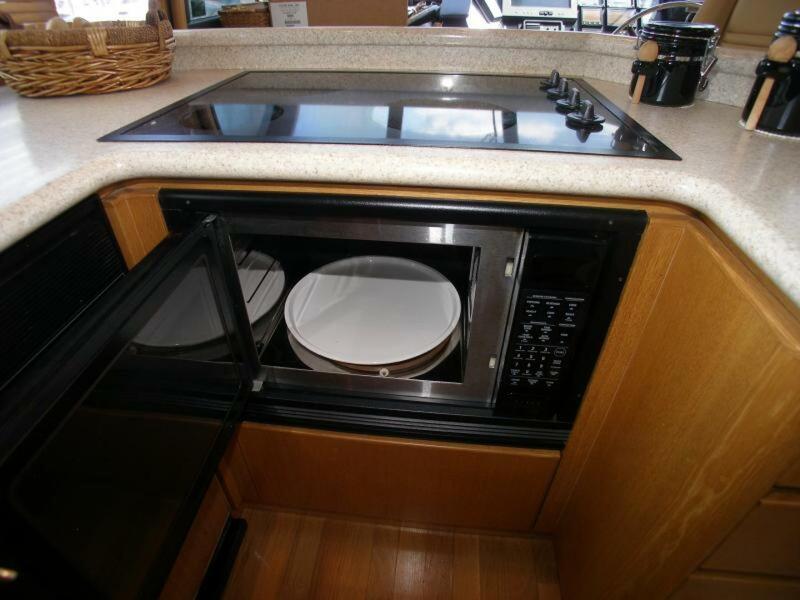 The Galley is forward and up 3 carpeted steps from the salon and on the port side and a wide easy stairway leading up to the fly-bridge is across to starboard. 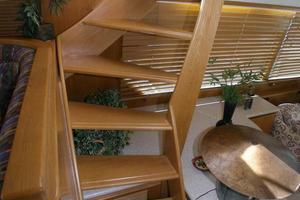 Just forward of these stairs is a dinette which seats 4 comfortably for dining. 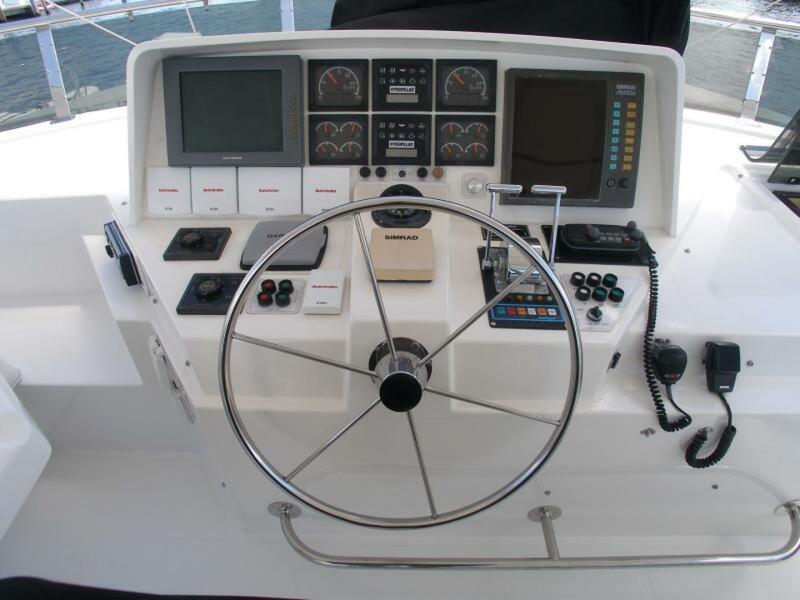 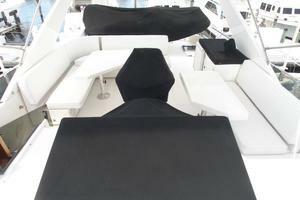 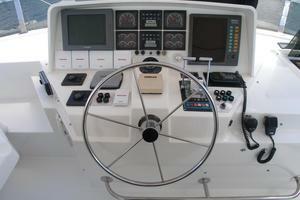 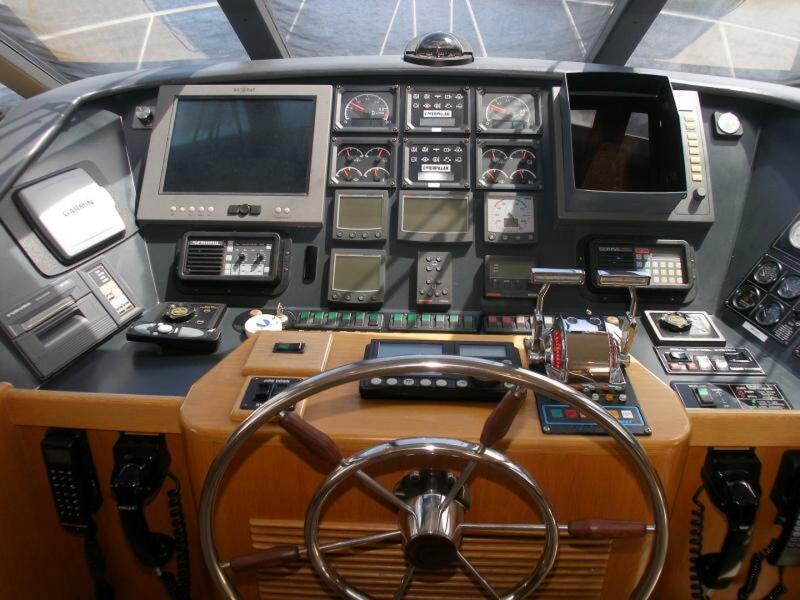 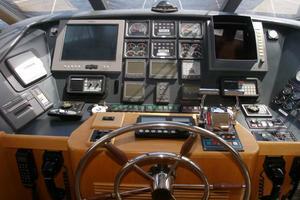 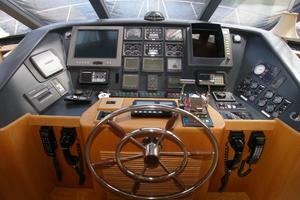 Forward and on the center-line is the lower helm station with Recaro leather helm chair. 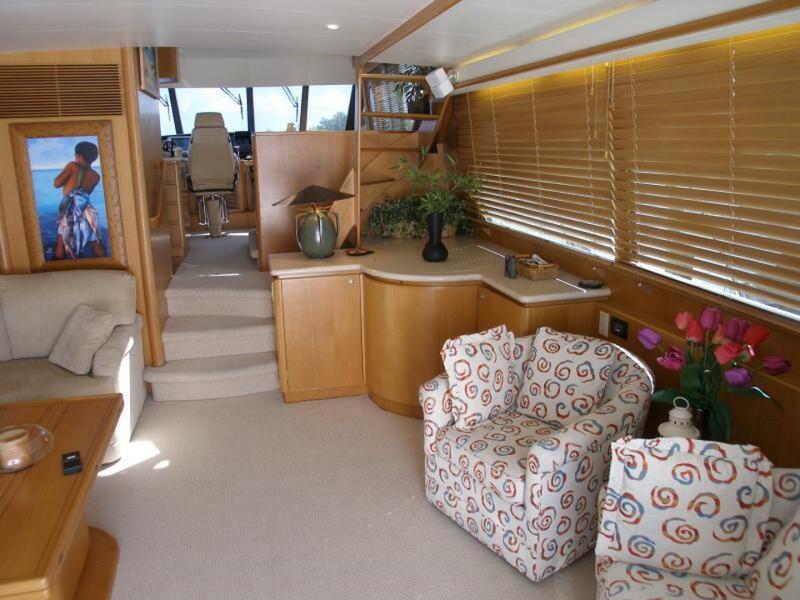 Side-doors to port and starboard lead out to the side-decks or, from the pilothouse a wide stairway with carpeted steps lead forward and down on starboard side to the accommodations’ deck for the owner and guests. 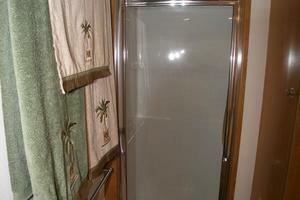 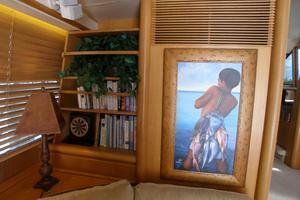 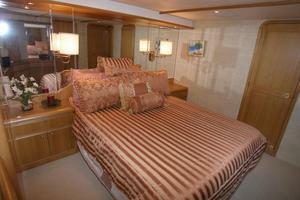 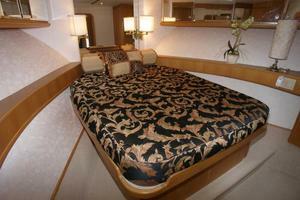 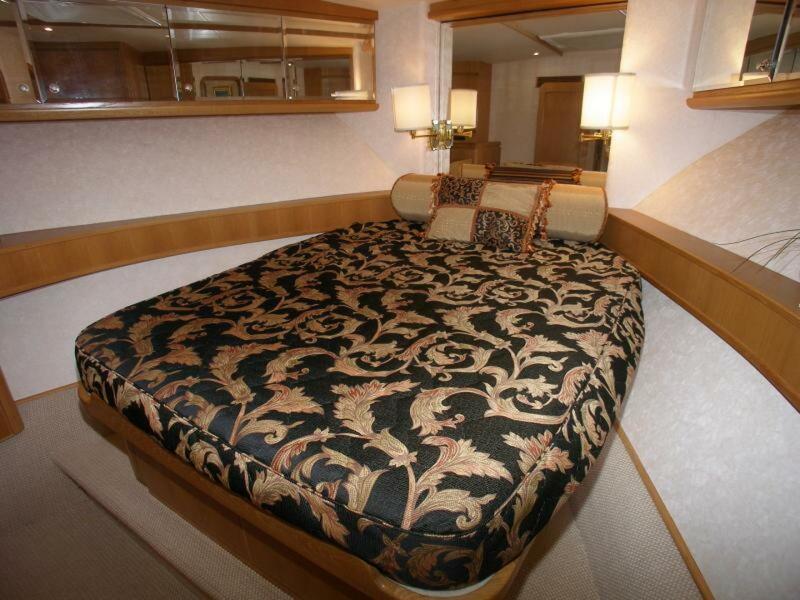 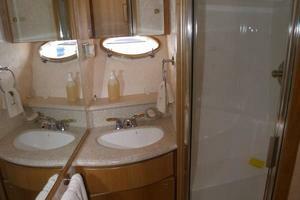 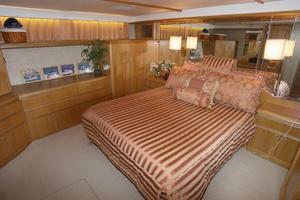 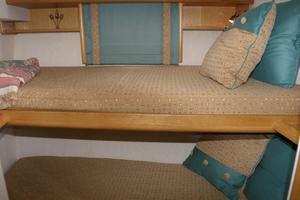 From the base of the stairs, the Master’s Stateroom is all the way aft with head and stall shower en-suite. 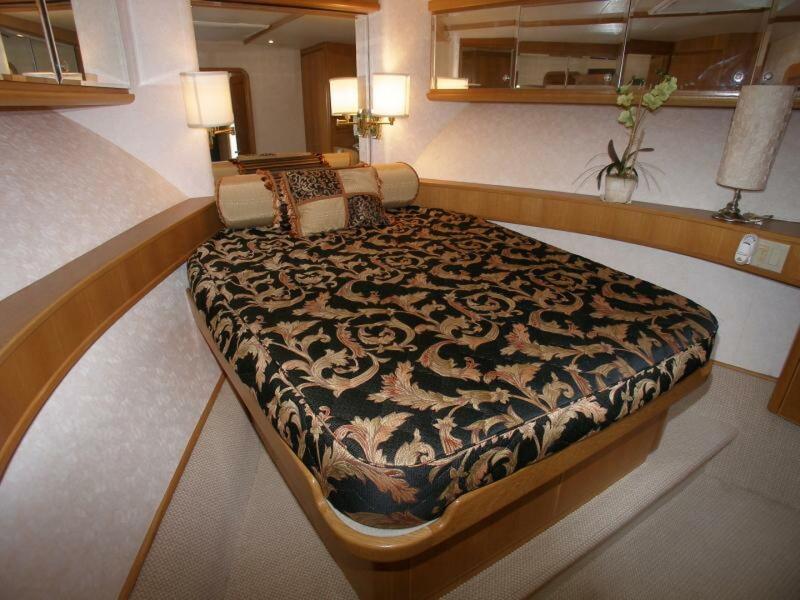 A queen-size bed is built in on the center-line with nightstands and reading lamps on either side of the bed’s mirrored headboard. 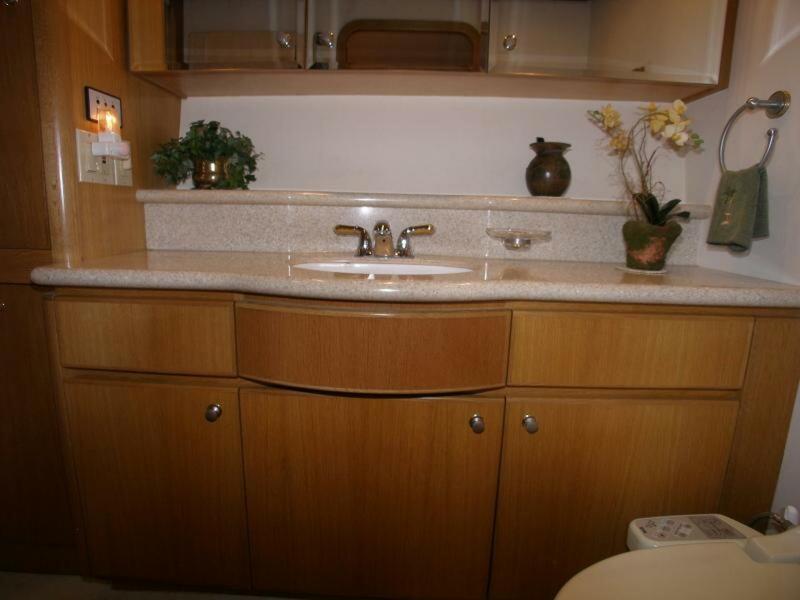 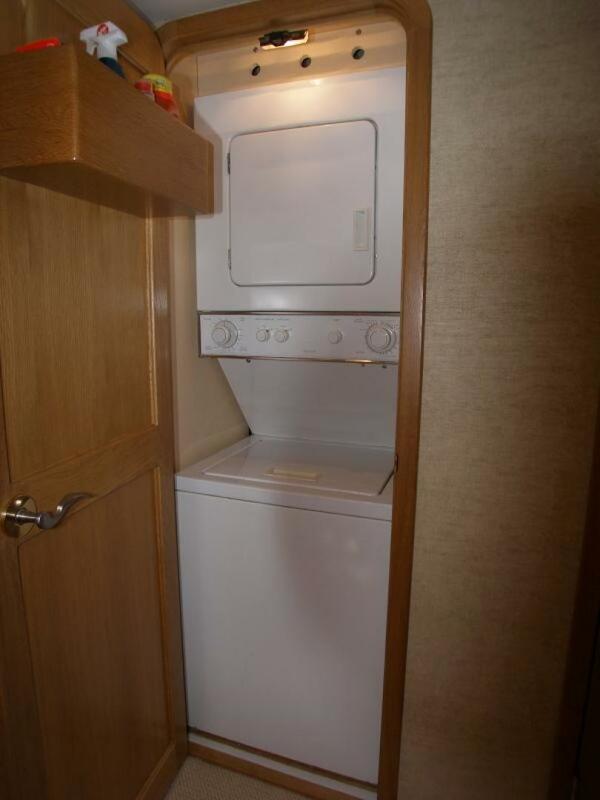 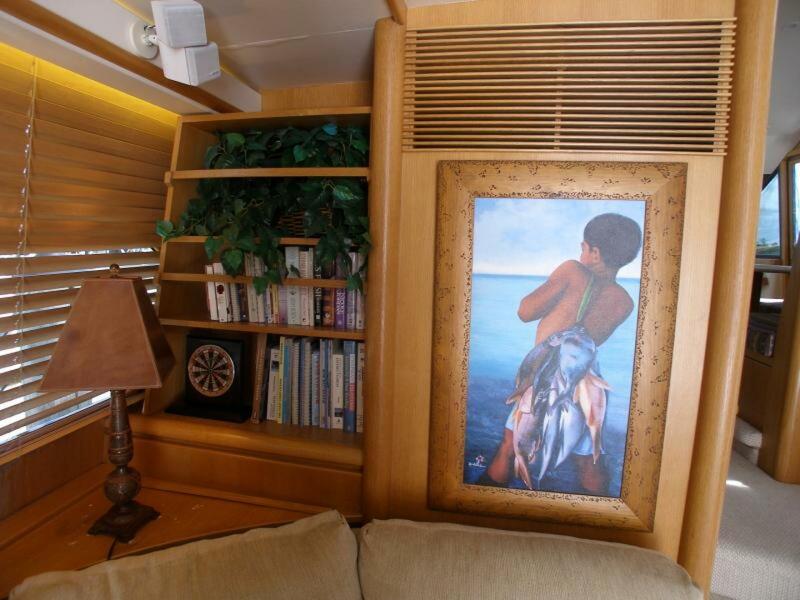 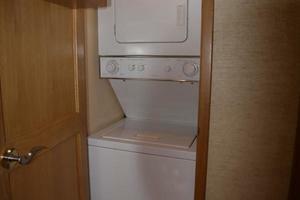 A cedar-lined “walk-in” locker is forward and on the portside of this stateroom and is next to a stacked clothing washing machine and dryer which is housed inside of a locker with oak wood door. 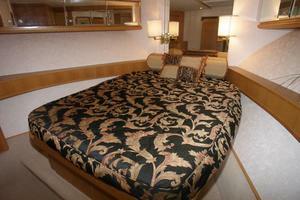 The head is on the portside of this stateroom. 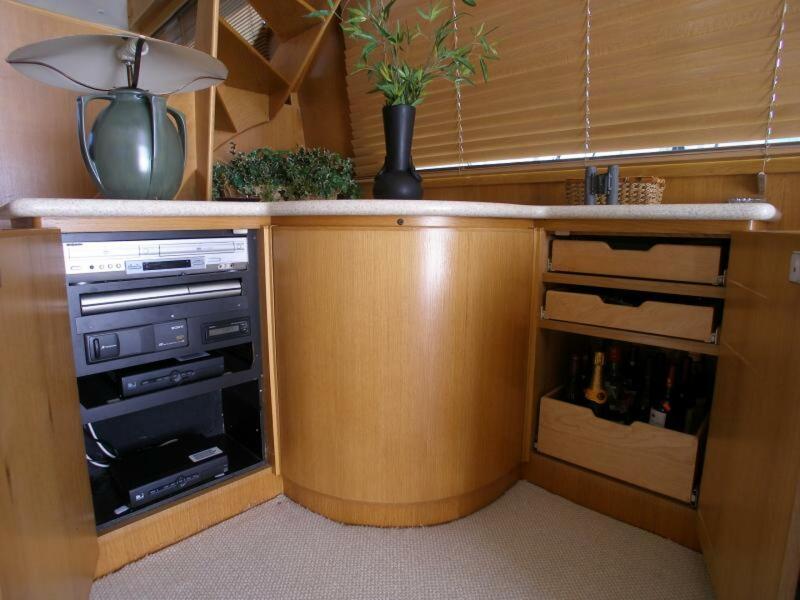 There is a mirrored vanity/desk with a make-up mirror and lighting, a chest of drawers and two large and deep drawers underneath the foot of the bed for clothing storage. 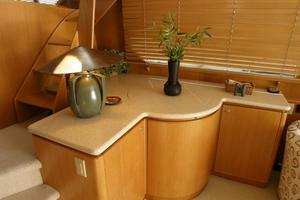 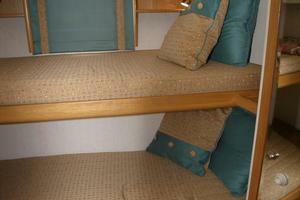 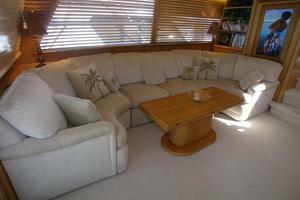 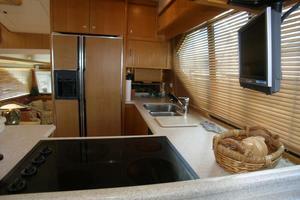 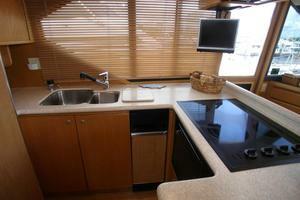 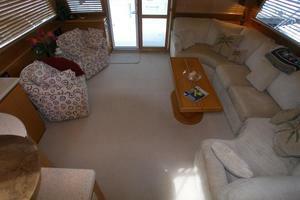 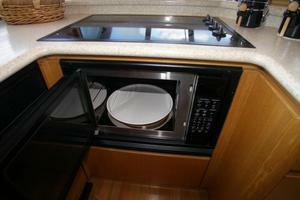 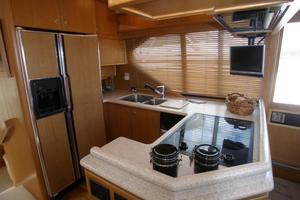 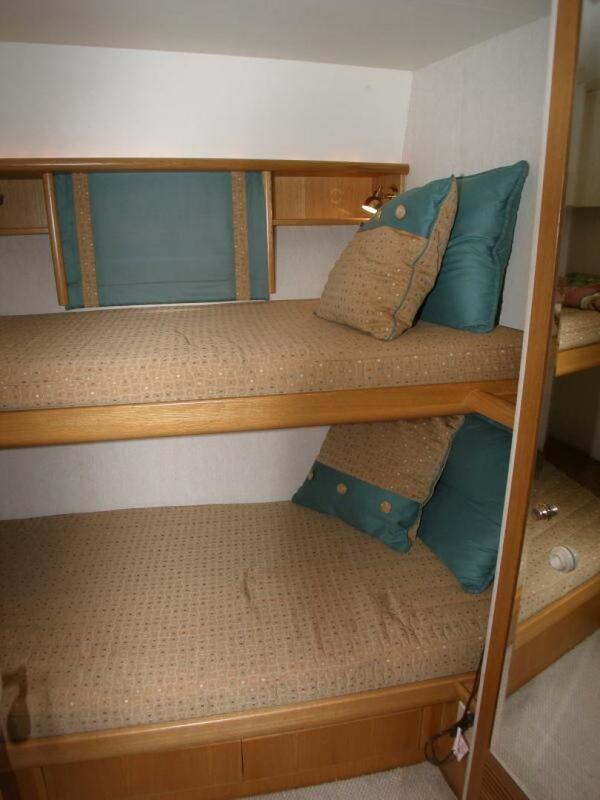 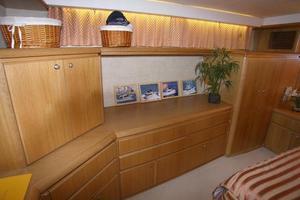 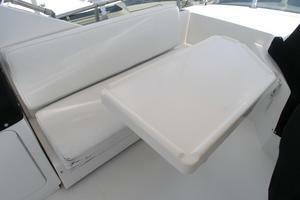 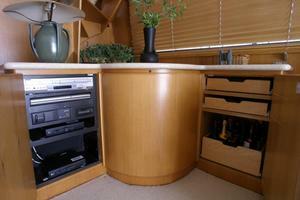 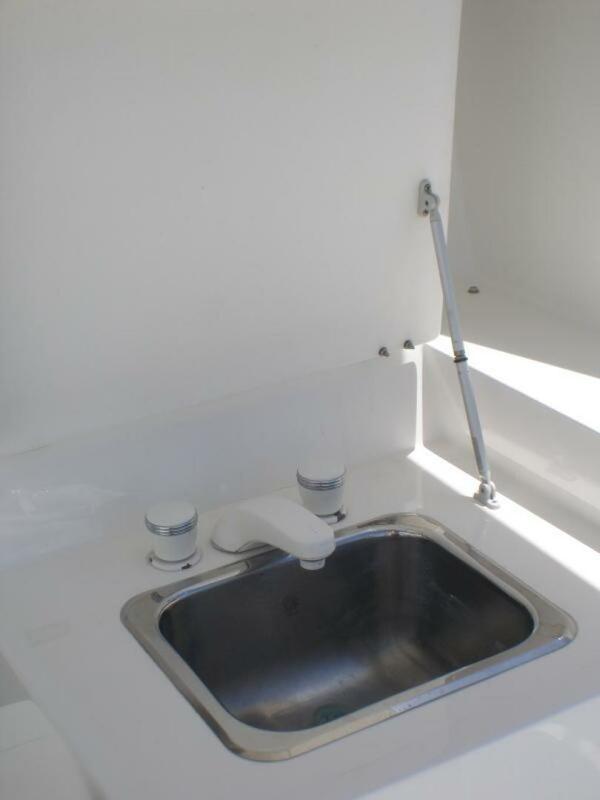 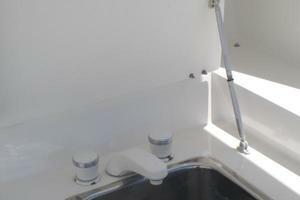 Additional clothing storage is provided by a large hanging locker which is situated aft and on starboard side. 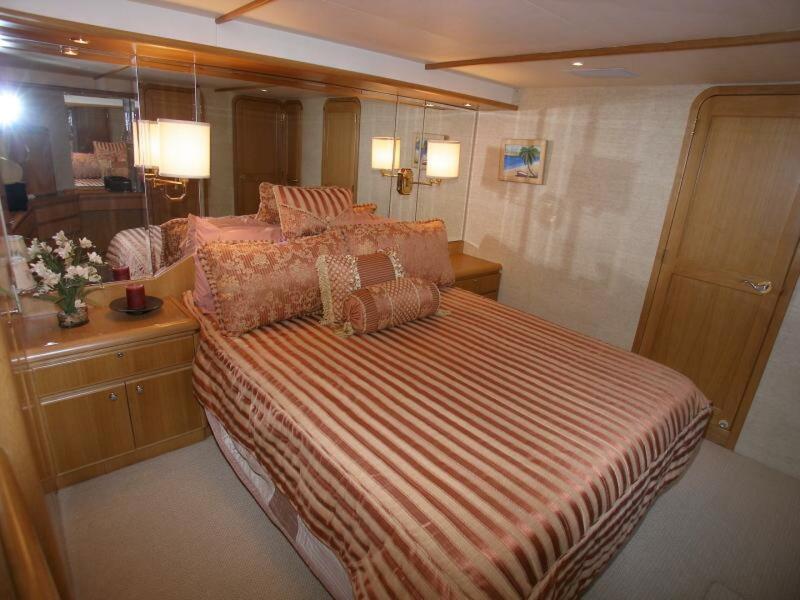 Forward of the master’s stateroom a companionway leads past the second guest’s stateroom with single bunk berths on the portside and shared guest’s head with stall shower to starboard and all the way forward the VIP stateroom with queen-size berth on the center-line and a private access door into the guest’s head. 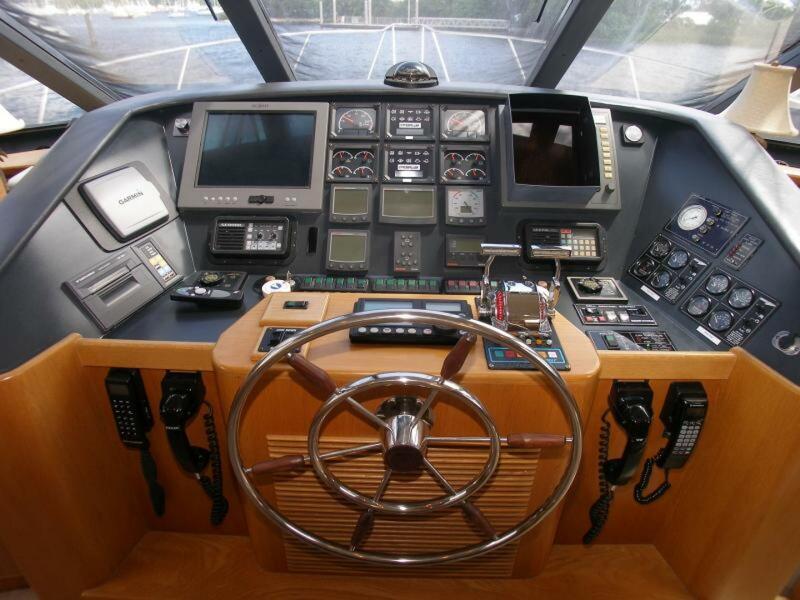 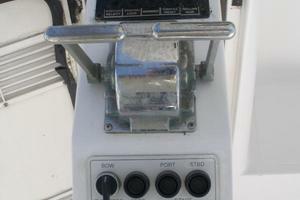 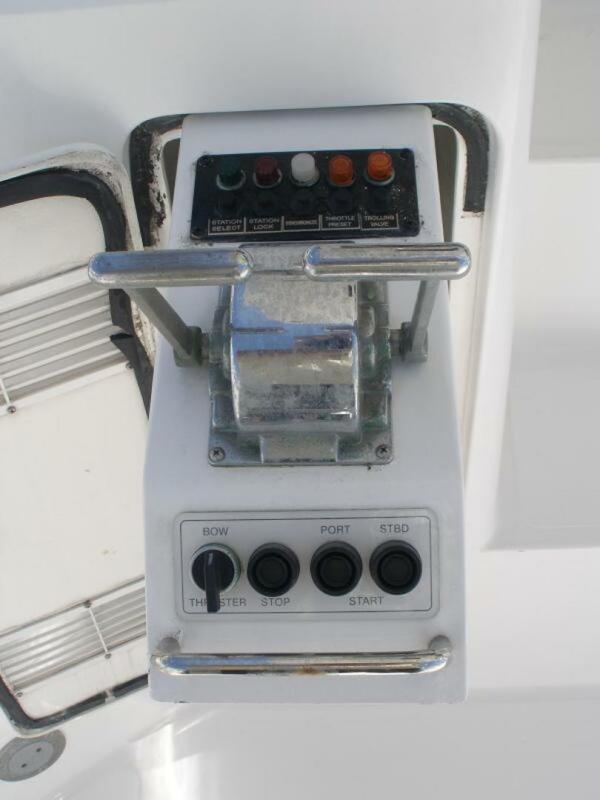 The fly-bridge or “command-bridge” features a helm station on the centerline and a single pedestal seat for a helmsperson. 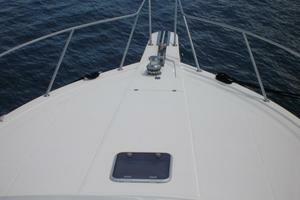 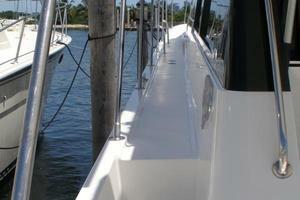 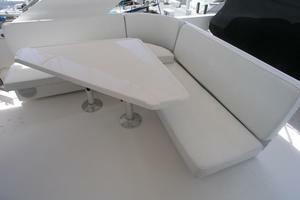 A hinged aluminum radar arch overhead supports the yacht’s antennas and a Bimini Top shades the fly-bridge. 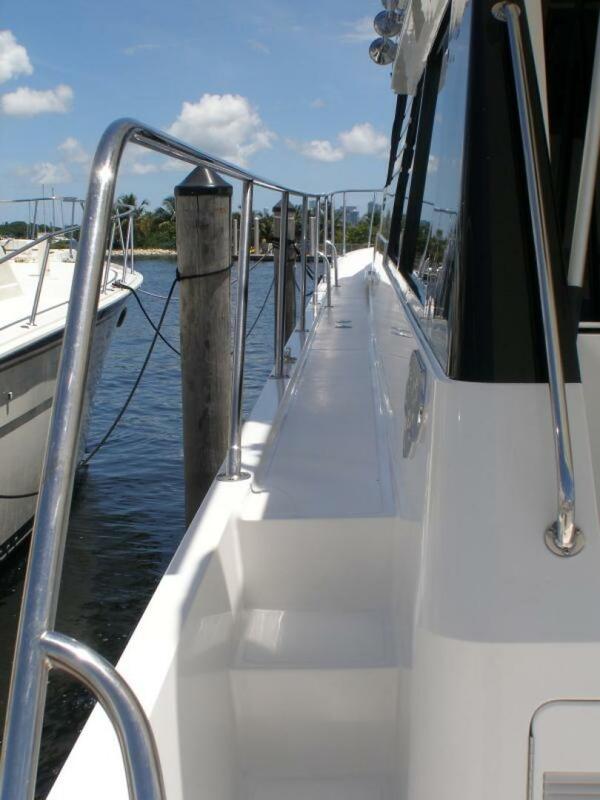 A Boat-deck with tender chocks and davit are all the way aft and from here, a hatch and stairs lead down to the aft-deck. 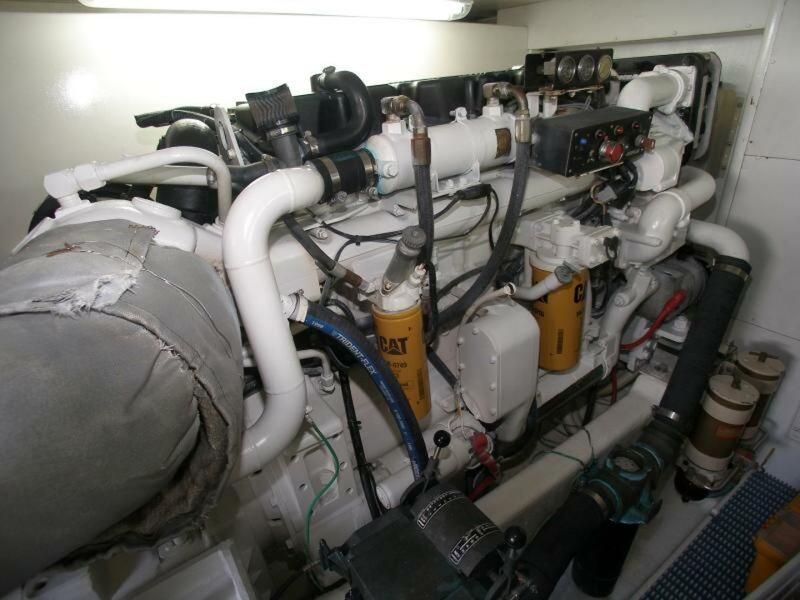 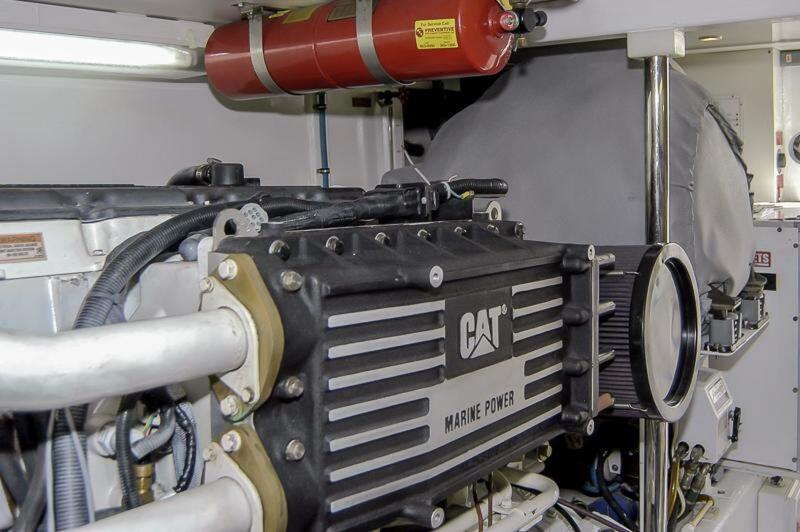 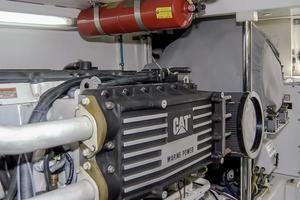 The Engine-room houses the two 800 horsepower Caterpillar 3406E main engines, 2 – 20 KW auxiliary generators and twin 500 gallon saddle-tanks for fuel. 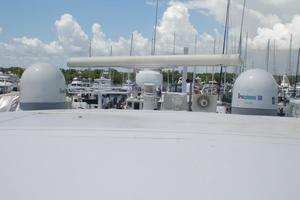 This area is well illuminated with 110 VAC florescent lighting as well as 12 VDC lights in the overhead. 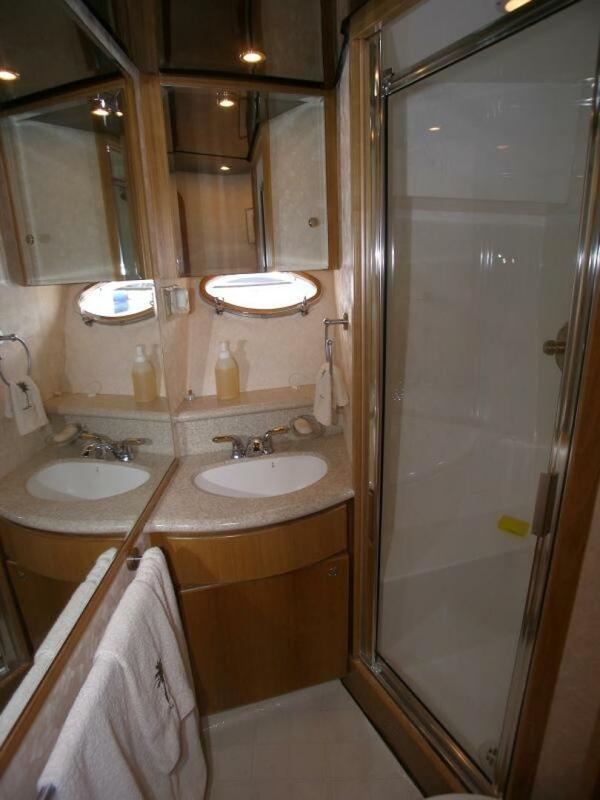 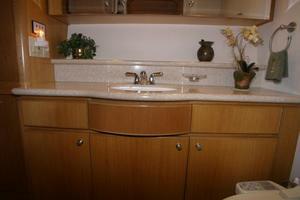 Head en-suite with stall shower, FW flush marine head/bidet and vanity w/ corian counter and under-mount sink. 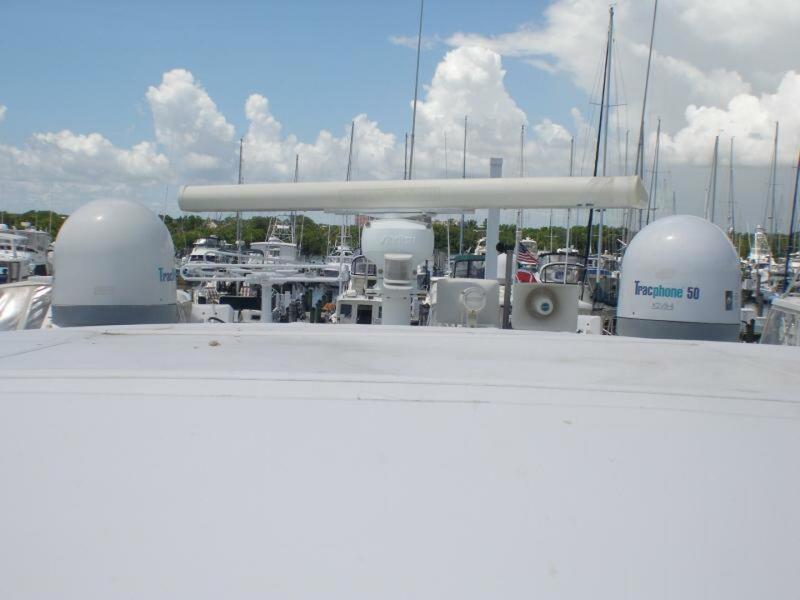 Hinged Alum radar arch lays back and down to reduce vertical clearance required. 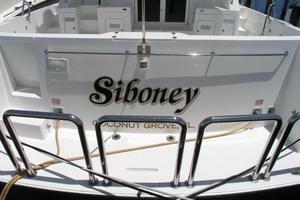 Most of the ship's systems aboard "Siboney" are going to require servicing, due mainly from lack of use but having said that, during March, 2018, "Siboney" was driven from her berth in Coconut Grove on Biscayne Bay and up the Miami River where the yacht was hauled for a bottom job. 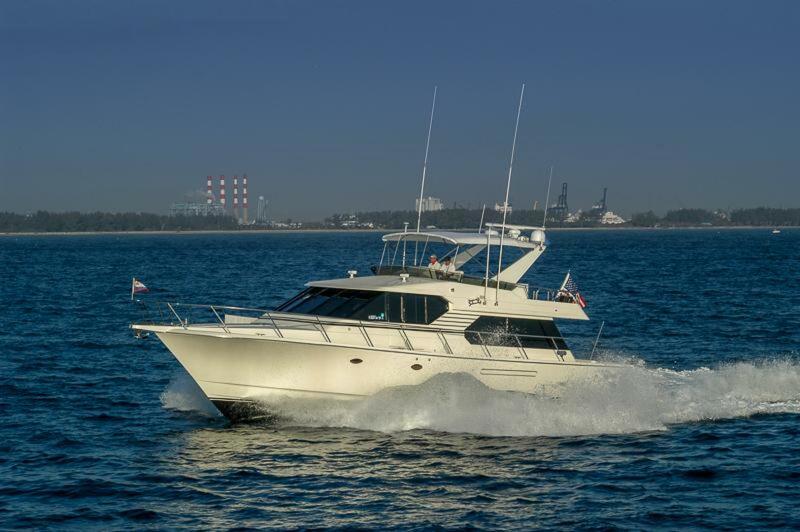 Providing spirited performance, exceptional maneuverability, excellence in design and engineering and built to the highest standards of craftsmanship, this West-Bay SonShip 58’, once refit, will provide years of adventure, exploring the islands and harbors off of the “beaten track”. 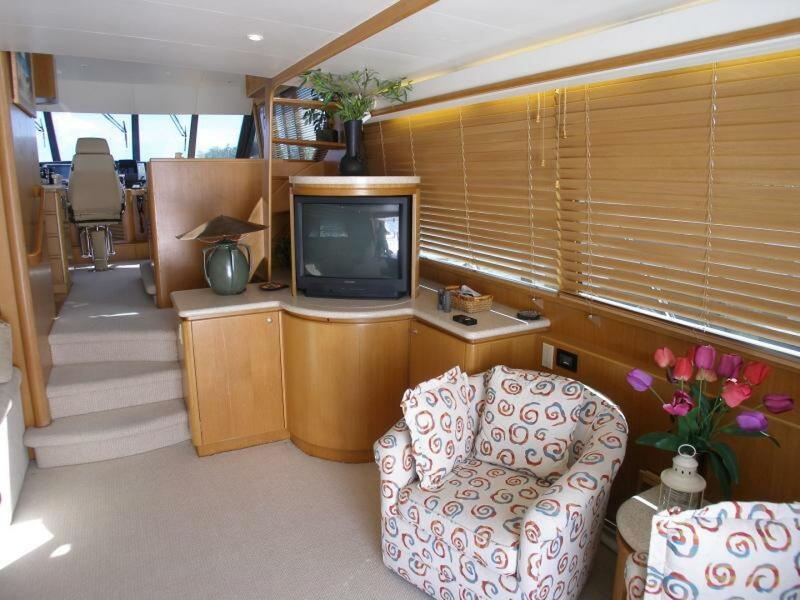 The West-Bay 58 design is a perfect vessel for a cruising family or one comfortable for 2 couples who want to get away for a long weekend. 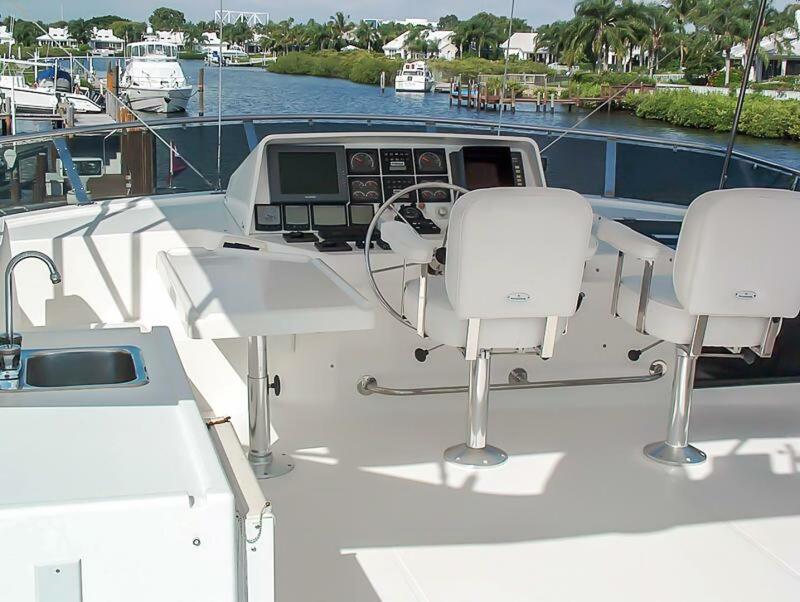 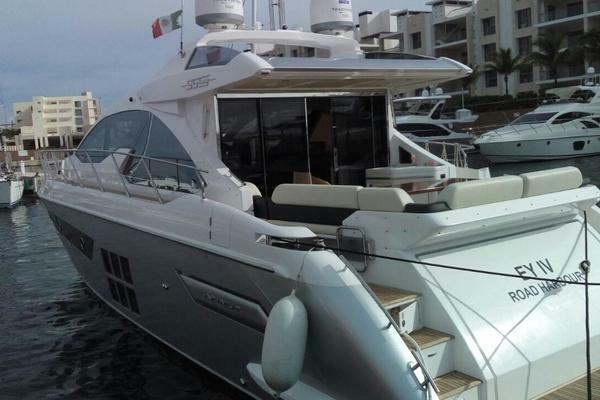 The design is easily managed by only two persons and the yacht’s shallow draft and an exterior requiring relatively little maintenance combine to make the West-Bay SonShip 58 a fun boat to own.